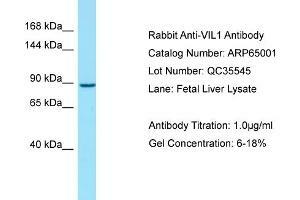 Characteristics This is a rabbit polyclonal antibody against VIL1. It was validated on Western Blot. Background This gene encodes a member of a family of calcium-regulated actin-binding proteins. This protein represents a dominant part of the brush border cytoskeleton which functions in the capping, severing, and bundling of actin filaments. Two mRNAs of 2.7 kb and 3.5 kb have been observed, they result from utilization of alternate poly-adenylation signals present in the terminal exon.